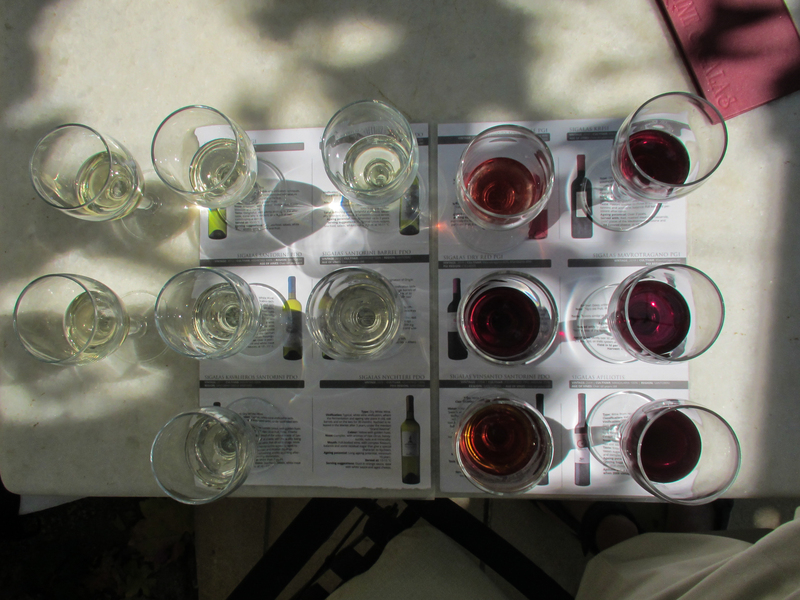 Since it was the wine of Santorini that caused us to revisit the island, it seems only right that we give it its own blog post. 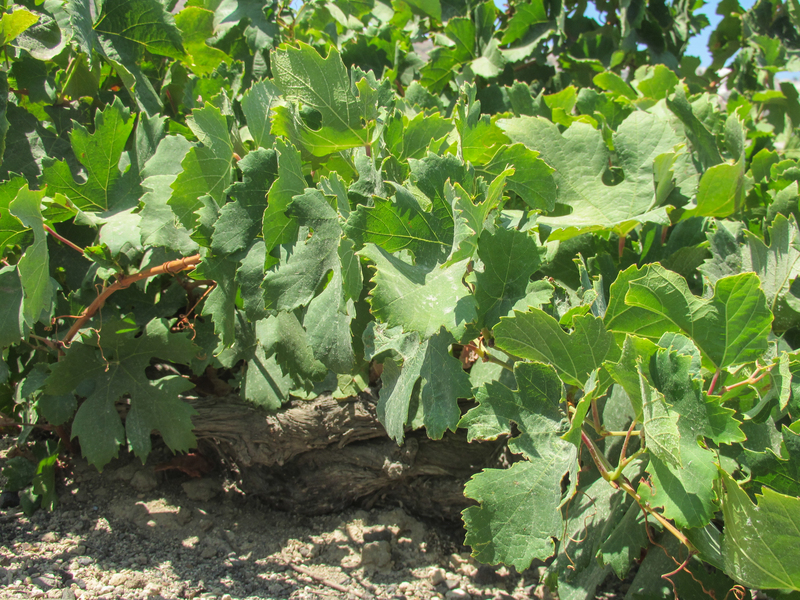 Santorini wine is remarkable because the vines are cultivated in conditions that more or less preclude the growth of vegetative matter of any sort. The vineyards are hills and slopes of volcanic pumice. Any rain that might fall would drain through this stuff in about a second. In any event, though, it doesn’t rain. One winery rep this summer told us that the last rain had been in May and the next one would be in November. And, on top on the annual summer drought, there’s the matter of the sun. It’s a merciless, desiccating, searing physical force that feels like a giant broiler overhead. 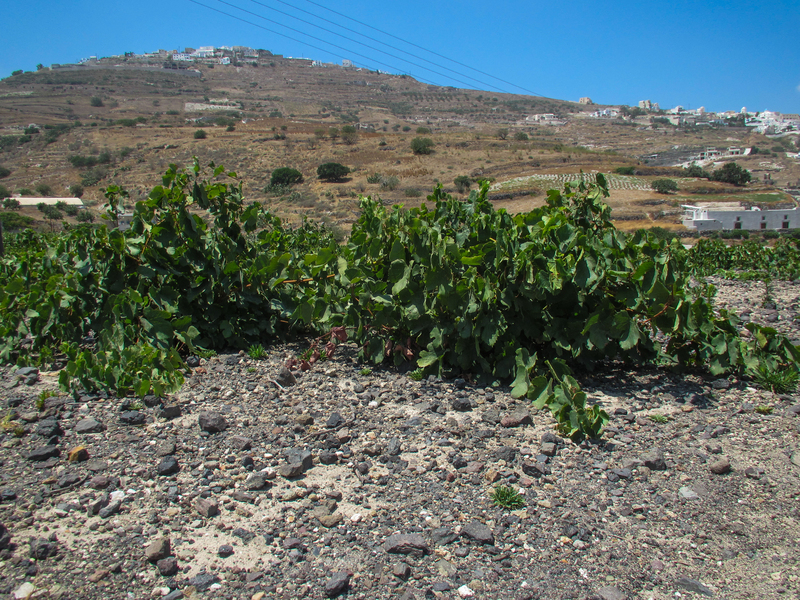 One might add wind to this recipe for desertification but in the case of Santorini’s vineyards, light and moderate winds are a blessing because they carry moisture from the sea up the slopes to the vines. And Santorini’s winemakers long ago developed a unique method of capturing that moisture. Unlike vineyards elsewhere that grow grape vines supported on trellises, here the vines are trained in a circle, one branch on top of another, until a “basket” of living vine is created. The grapes grow inside this basket, providing protection from strong winds, and the leaves overhead shade the grapes and help collect moisture. A vineyard near the Argyros winery. Not sure if it belongs to Argyros. A single vine, about a month before harvest in mid-August. A few grape clusters are visible on the left. And, as it turns out, the arid climate and the soilless vineyards also provide some benefits to the vines. 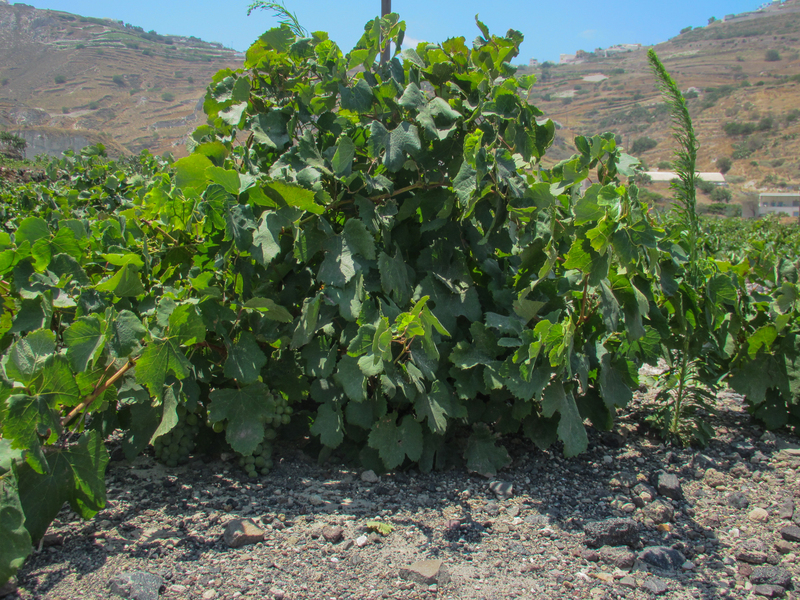 First, the phylloxera virus that ravaged european vineyards and required they all be replanted with vines grafted to American rootstock never affected Santorini’s vines because the virus cannot survive in the pumice fields. As a result, some of the vines on this island are thought to be 500 years old — the oldest in the world. Second, the grapes can be left laying on the ground without worry about rot or mildew. 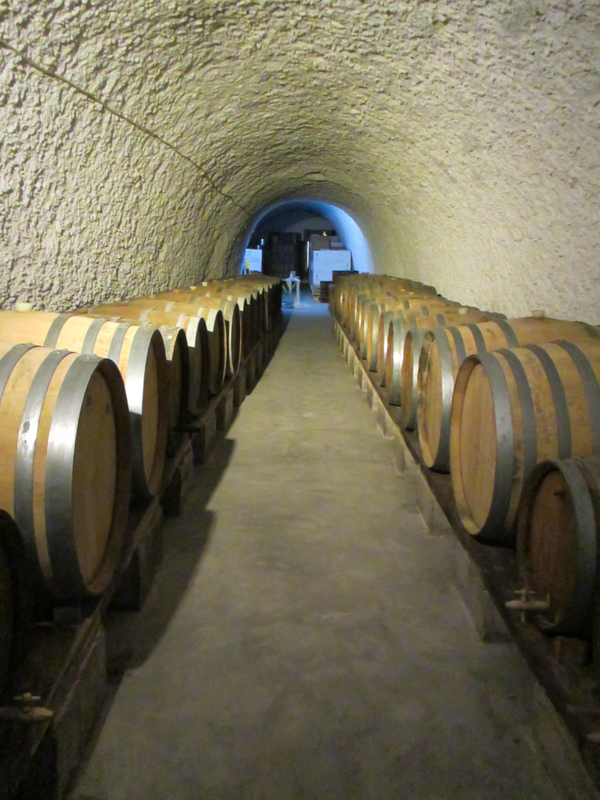 A wine-aging cave dug into the pumice at the Art Space winery. The king grape of Santorini is called Assyrtiko, and in the island’s volcanic soil it produces a white wine of stunning power and elegance. Sharp minerality, citrus, and nose of the island’s wild herbs make it not only ideal for sipping on warm evenings but also a marvelous partner to lamb and grilled seafood. 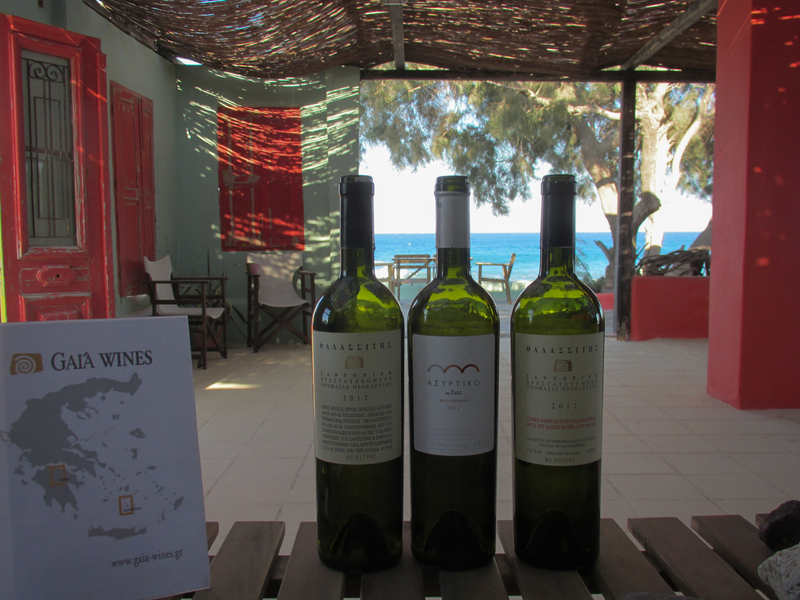 Other parts of Greece produce some assyrtiko but the examples from Santorini are singular and sensational. Even more intriguing, these wines can be aged 5 years and more, although I’ve never been able to leave a bottle unopened for more than 2 years. The tasting room at the Gaia winery. Spectacular wine, too.